I had the pleasure of documenting Brianna and Matt's wedding yesterday at the Villa Antonia outside of Austin. 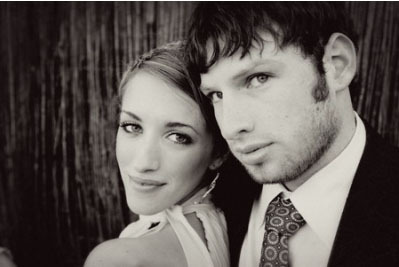 Brianna and Matt had a Hepburn/Sinatra vintage era vibe about them. Their funky sense of style went across the board, from her choice of bridesmaid's dresses (ok, I'm calling it - best bridesmaid dresses ever) to their selection of jazz vocalist Lynn Ross to croon at their reception. So it was only fitting to shoot a vintage super 8 wedding film. Unfortunately, I have to send the film off to the lab, so you won't see a preview for a few weeks, so keep checking back. In the meantime, enjoy more of their engagement photos by Heather Mabry, and stay tuned to her blog for what promises to be some one of a kind wedding pics!